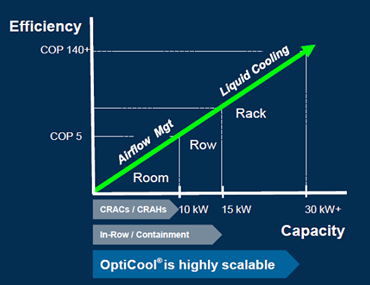 OptiCool® revolutionizes data center design by reducing the need for airflow management as the primary design criteria for cooling. 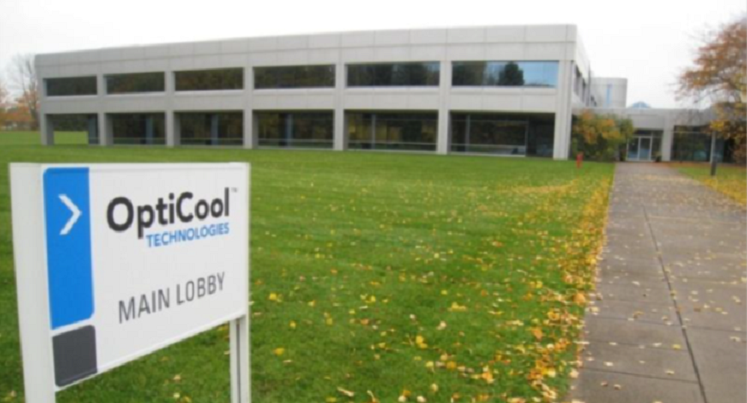 In2013, we were recognized by Gartner as a “Cool Vendor” in Data Center Infrastructure, Power and Cooling. 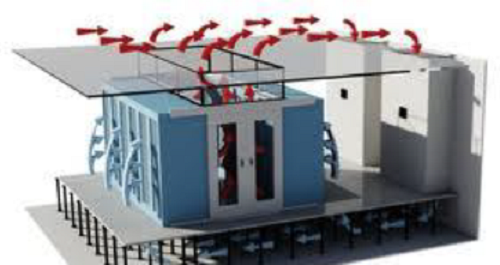 Managing airflow in the data center is overly complex, costly and ineffective. 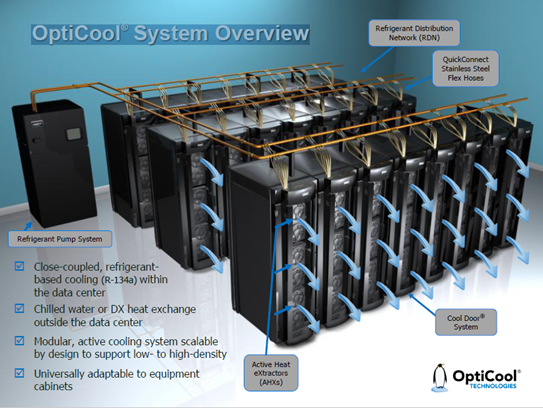 In addition new high density server technology and storage virtualization platforms requires high-density cooling. Computer room air conditioning with “containment” is poor design. It is energy intensive due to fans moving the air, low capacity per rack, poor utilization of space, and essentially is a “contrivance” system. In-Row Cooling is floor space and energy intensive with low capacity per rack and poor utilization of space. It also is energy intensive due to fans and is ineffective at redundancy. 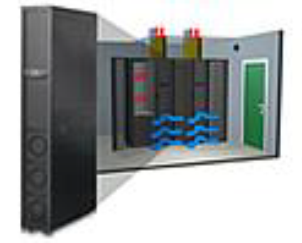 High density server technology and storage and virtualization platforms require high density cooling. 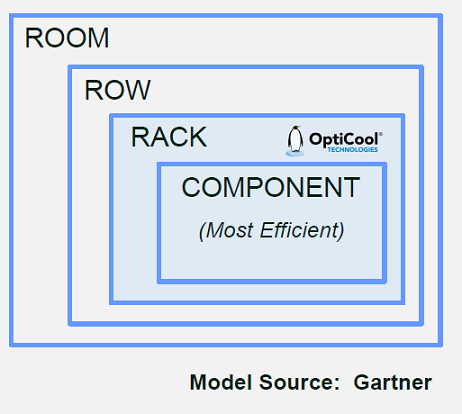 The Gartner Data Center Cooling Efficiency Model as depicted below shows that Cooling closest to the heat source drives efficiency and the least efficient is the conventional “cool the room” approach. Given that leading OEMs are forecasting electronics heat density will continue to increase, “rack utilization” is increasing (Gartner) and “rack height” is increasing (IMS) how does OptiCool® future-proof design? OptiCool® is highly scalable supporting low- to high-density (currently up 30 KW / rack) with far superior efficiency. 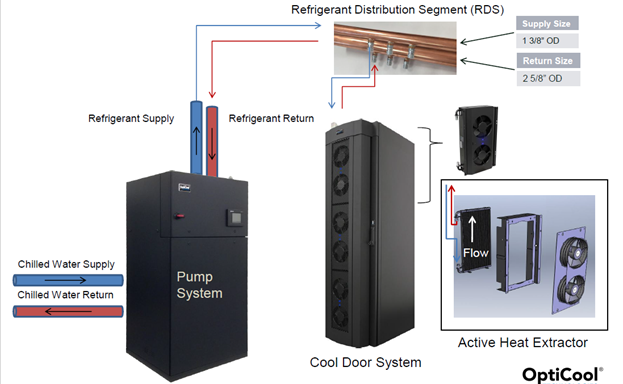 Since conventional cooling has capacity limitations and is inefficient and containment is limited to ~15 kW and has efficiency limitations an alternative solution is required for high density and high performance computing environments. The OptiCool® rack containment solution is highly scalable supporting low- to high-density environments (up to 30 KW / rack) with far superior efficiency. to help revolutionize your date centre design and we will help you to access the subsidies available from your local electricity provider to optimize your investment. Click the button below to view a video of the OptiCool Liquid Cooled Cabinet Doors.